With Ace Frehley seemingly uninterested in continuing with the Frehley’s Comet reunion and long-time guitarist Richie Scarlet being recently let go from his band, the former KISS guitarist’s former solo band members have united to form the group Return Of The Comet. Return Of the Comet consists of John Regan on bass (Frehley’s Comet, Ace Frehley Band, Peter Frampton), Tod Howarth on guitar/lead vocals (Frehley’s Comet, Cheap Trick, Ted Nugent), Richie Scarlet on guitar/lead vocals (Frehley’s Comet, Ace Frehley Band, Mountain) and Steve “Budgie” Werner on drums (Ace Frehley Band, Leslie West, Hindenberg). “Together, John Regan (Peter Frampton bassist), Ace Frehley (KISS guitarist) and world-renowned drummer Anton Fig co-founded the classic hard rock band Frehley’s Comet in 1984. The band Frehley’s Comet went on to sell well over 1.5 million albums, had 4 albums in the Billboard Charts and had multiple MTV music videos in heavy rotation from 1987 to 1990. Now for the first time ever, Frehley’s Comet alumni: John Regan, Tod Howarth, Richie Scarlet and Steve “Budgie” Werner will celebrate their writing, recording, touring and co-production contributions to the Frehley’s Comet legacy, by performing the hits & classics from the Frehley’s Comet catalog and more, under the name “Return Of The Comet”. The ROTC wants you! Don’t miss it. 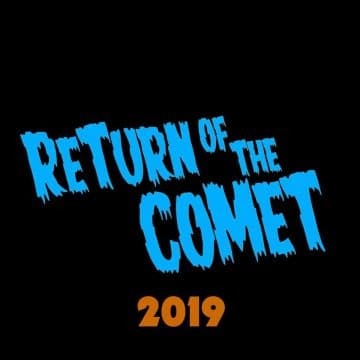 Return Of The Comet already have one show at the Sellersville Theater in Sellersville, Pennsylvania, USA on April 9, 2019.